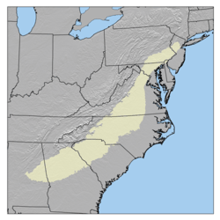 The Atlantic Seaboard fall line marks the Piedmont's eastern boundary with the Coastal Plain. To the west, it is mostly bounded by the Blue Ridge Mountains, the easternmost range of the main Appalachians. 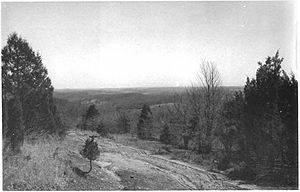 The width of the Piedmont varies, being quite narrow above the Delaware River but nearly 300 miles (475 km) wide in North Carolina. The Piedmont's area is approximately 80,000 square miles (210,000 km2). The name "Piedmont" comes from the French term for the same physical region, literally meaning "foothill", ultimately from Latin "pedemontium", meaning "at the foot of the mountains", similar to the name of the Italian region of Piedmont (Piemonte), abutting the Alps. ^ a b "Piedmont". The Columbia Gazetteer of North America, 2000. Archived from the original on 2005-03-10. Retrieved 2007-12-09. Wikisource has the text of The New Student's Reference Work article about "Piedmont". "Piedmont Plain" . New International Encyclopedia. 1905.